The study will comprise of five treatment arms of 300 participants each. The first two arms will receive Pa(100mg)-M-Z and Pa(200mg)-M-Z for four months. The third arm will receive Pa(200mg)-M-Z for six months and the fourth arm will receive HZRE for six months. These four treatment arms for drug-sensitive TB will be randomised. The drug-resistant TB arm will also receive Pa(200mg)-M-Z for six months. Participants in the study will be followed up at 12 and 24 months after randomisation. If it proves effective in a phase III trial, the new regimen would reduce the pill burden associated with MDR-TB treatment by 97% and reduce its cost dramatically. 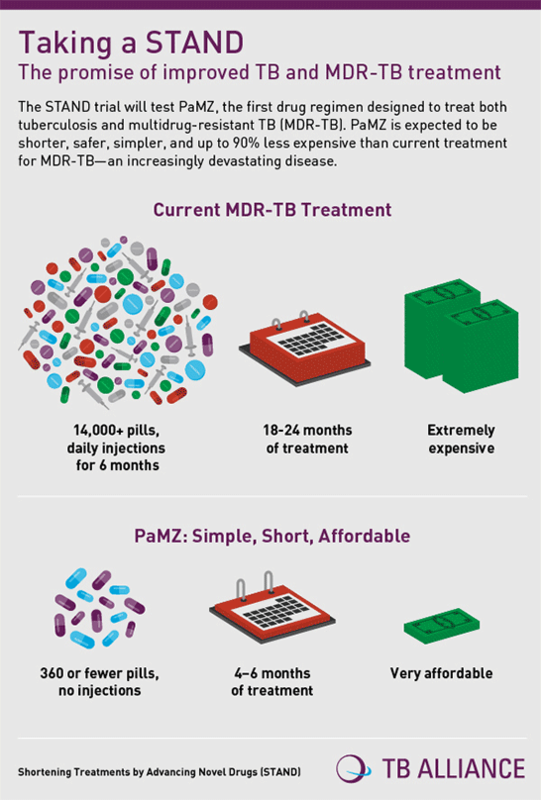 Both moxifloxacin and pyrazinamide are generic antibiotics, and the TB Alliance estimates that the new regimen might reduce the cost of MDR-TB treatment by 90%. Everitt D et al. Randomized trial of the bactericidal activity of 8-weeks treatment with moxifloxacin, Pa-824, and pyrazinamide in drug sensitive and multi-drug resistant tuberculosis. 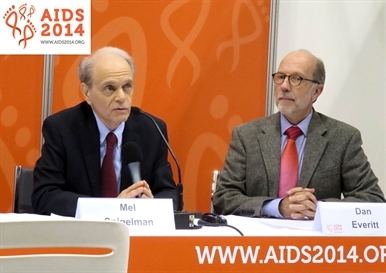 20th International AIDS Conference, abstract MOAB0202, Melbourne, 2014. A video of a press conference on TB, held on 21 July, is available on the conference YouTube channel.